When most people think of Charlotte, motorsports are never far from their minds. Not only does NASCAR have some of its most important races and its Hall of Fame here, but a thriving automotive manufacturing and service industry has arisen as well, creating the perfect environment for both competitive and ordinary driving. ExpeditedFreight.com makes sure that these automotive producers – as well as all of the Queen City’s other businesses – have the supplies they need to stay at the top of their game. 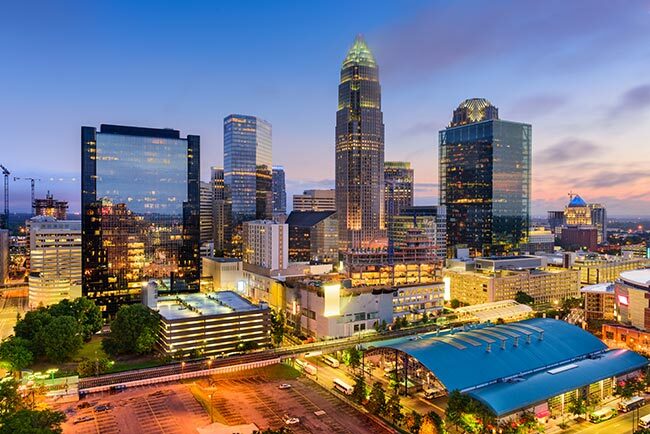 Charlotte is the largest city in the Tar Heel State and one of the largest in the American South, with a metropolitan population of more than 2 million people. Combined with the complex logistical needs of local automotive companies and other businesses, this is a recipe for constant congestion. Commuters and freight carriers must compete to use the roads, leading to severe traffic on a regular basis. As a result, it’s hard for auto firms like Freightliner, Volvo, and Timken to get the supplies they need for their Charlotte facilities. ExpeditedFreight.com resolves all logistical challenges for automakers, auto supply companies, and other businesses in Charlotte and its surrounding area. Dedicated Trucking - By reserving a truck just for you, ExpeditedFreight.com is able to deliver your goods as directly as possible, without needing to serve other customers first. Our dedicated trucking strategy also improves safety, since it gives us the flexibility to load specialized storage equipment that can preserve even the most delicate or perishable goods. Team Driving - Whenever you need a delivery over a certain distance, we assign two drivers to operate the truck. These drivers are required to switch between resting and driving. That way, both of them can stay fully rested, but there’s no need to stop the truck overnight. We can thus get your goods to you at maximum speed without taking any unnecessary risks. 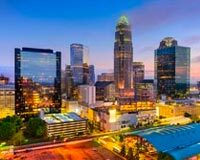 Proactive Planning - When you need us to ship into Charlotte, we come up with a comprehensive plan to do so. We begin by finding the closest truck to your starting point; this is easy for us given that we have vehicles stationed in major metropolises throughout the US, as well as in most Canadian cities. We then find the most effective route into Charlotte or into neighboring communities like Concord, Greenville, Gastonia, Spartanburg, Greensboro, or Winston-Salem. This doesn’t necessarily mean the shortest route, but rather the quickest one given traffic, weather, road quality, and all other contingencies. Tracking & Reporting - Armed with advanced tracking technology, we can identify the location of your order at any point in the delivery process. Not only does this help us avoid delays, but it means that whenever you call our 24/7 customer support line, we will be able to tell you exactly where the truck is and when it will arrive. For a free quote on expedited freight services in the Charlotte area, contact ExpeditedFreight.com at (704) 325-4111.